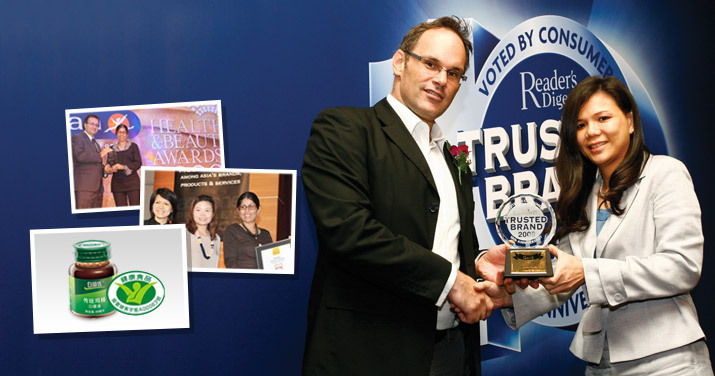 Singapore, May 11 2009 – Cerebos Pacific Ltd – South Asia was awarded the prestigious “Best Brands (Health)” Award for BRAND’S® at Guardian’s Health & Beauty Award 2009. The ceremony, hosted by Guardian, S.E. Asia’s largest pharmacy chain, was held in May. BRAND’S® toppled keen competition among 31 participating brands to win this prestigious award. Some of the 31 participating brands were Centrum, Redoxon, Jordel’s, New Moon, Meiji Collagen, Hypocol, Blackmores, Panadol, and Omron. The other two winners for Best of the Best Brands awards were Colgate and L’Oreal Paris. “Best of The Best Brands (Health)” Award was selected entirely through consumer votes, which affirms BRAND’S® as the choice brand that consumers trust. On sales performance, BRAND’S® Essence of Chicken also emerged as Winner in Health Supplement (Health Tonic) category.